2. Cap the jar and let it mellow in a cool dark place for a day to a week. For pleasing potpourri, experiment with different blends of herbs, flowers, berries, pods, and other plant material, along with essential oils and a fixative like orris root. Mix the dried materials in the crock, stirring gently with your hands. Sprinkle in the orris root mix as you go along. Let it sit overnight, take a whiff, and adjust the formula as desired. Let the potpourri mellow for 2 weeks. Check the scent again, and make any needed adjustments. Allow the mix to sit for 2 more weeks. To use the potpourri, open the lid to perfume a room. Close the container after several hours to preserve the scent. The fragrance of an ideal potpourri is a mix of many scents that's not dominated by any one ingredient. Potpourri blends should also look as nice as they smell, with distinct leaves and flowers. "Fragrance-crafting isn't an exact science," says herbalist and artist Terry Whye of the Whye Clay Works Pottery Studio in Finksburg, Maryland. "Keep playing until you achieve a blend that you really like. And don't forget to take notes so that you can make it again!" Terry gathers material for her best-selling potpourri blend throughout the year. It includes evergreen needles from the holiday tree, flowers and herbs, and spicy bay leaves and juniper berries. 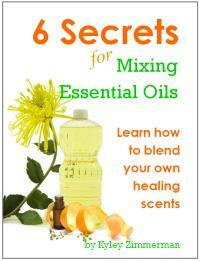 Terry fine-tunes the blend with essential oils and a fixative to preserve the scent. "The mix changes every year because my garden changes,' says Terry. The beauty of making your own potpourri mixes is that you can adjust the way they look and the way they smell to match the changing seasons. In winter. Use bay leaves, sweet birch bark (Betula lento), wild black cherry bark (Prunus serótina), dried citrus peel, evergreen needles, small pine cones, sassafras roots (Sassafras albidum), and winter-green leaves (Caultheria procumbens). For spring and summer. Gather scented flowers, like basil, bee balm (also known as bergamot), borage, burnet (Sanguisorba minor), calendula, chamomile, red clover (Trifoiium pratense), daffodil, honeysuckle, jasmine, lavender, lily-of-the-valtey, marjoram, mint, mock orange (Philadelphus x virginalis), pansy, rose, flowering tobacco (Nicotiana alata), violet, wisteria, and sweet woodruff. Add fragrant leaves, like bee balm, citrus, eucalyptus, scented geranium, lemon balm, lemongrass (Cymbopogon dtratus), lemon verbena, lavender, mints, patchouli (Pogostemon cablin), rosemary, sage, sweet grass (Hierochloe odorata), thyme, violet, and sweet woodruff. Also use everlasting flowers, such as globe amaranth (Comphrena globosa), bells of Ireland (Moluccella laevis), hydrangea, rocket larkspur (Consolida ambigua), Lenten rose (Helleborus oriental is), red or pink peony petals, poppy flower heads, statice, winged everlasting (Ammobium ala turn), and yarrow. In autumn. Include bayberries (Myrica pen-sylvanica), coriander seeds, fennel seeds, hawthorn berries (Crataegus spp. ), juniper berries, nigella seed pods (Nigella damas-cena), rose hips, and smooth sumac berries (Rhus glabra). Terry likes to use seeds and pods that look interesting, like milkweed, acorns, and dried grass seedheads. 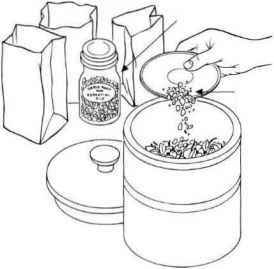 Dry ingredients and store in individual airtight containers until ready to prepare the mix. Terry dries her materials on screens and in baskets and paper bags in a warm dry room. "Don't dry or store everything together," she cautions. "You'll lose the individual fragrances." If your potpourri seems to have lost some fragrance, refresh it by mixing in 1 teaspoon of brandy or essential herbal oil. Experiment with these fragrant formulas to create or refresh potpourri. 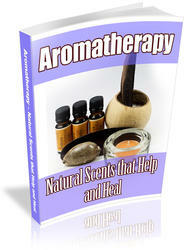 You have probably heard the term Aromatherapy and wondered what exactly that funny word, „aromatherapy‟ actually means. It is the use of plant oils in there most essential form to promote both mental and physical well being. The use of the word aroma implies the process of inhaling the scents from these oils into your lungs for therapeutic benefit.